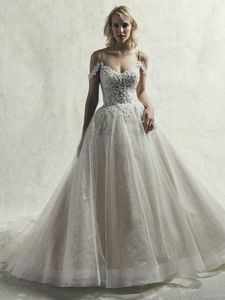 Description: This modern princess wedding dress is comprised of layers of embroidered lace motifs, beading, and Swarovski crystals accenting the sheer bodice and scoop neckline. A shimmering layer of sequin tulle adds dimension to the ballgown skirt. Finished with crystal buttons over zipper closure. Beaded spaghetti straps are attached, with illusion cold-shoulder sleeves accented in beaded lace motifs sold separately.